For the love of life: Who Does That????? Unity DOES!!!!!! They have invited me to guest design with them for the month of October! Today is the day to reveal the October Kit of the Month! I have been holding my breath ever since I got the invitation, as my friends know, this is something I have been dreaming of! So I finally can shout it out!!!! I am the Unity Guest Designer for the month of October!!!! Needless to say I am so excited to play along with all the talented Unity designers and OMG!!! with all the yummy Unity stamps! So this month, you will be seeing a lot of Unity stamped cards from me, get ready!! :) And here is the October KOM for you to take a look at.....I know you will love it!!! So today, I have a little card to share with you using the October kit, which is CUUUUTE beyond words, there are so many awesome images and sayings in it as usual!!!! Even a Sock Monkey!!! Lately I have been making wedding cards, so I decided to use one of the images that I felt would be fun for a wedding card. Also my sweet friend Karen and I made a little trip to Fabric Barn and picked up some amazing trims at an amazing price, so I am using them on this little card. I also added a little GCD papers to this card, which is just perfect for this card! Anyway, here is my card. If you would like to see details of this card, just click on the image to enlarge it. 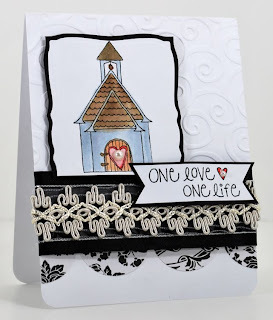 Anyway, if you didn't come here from Angela's Unity Stamps Blog, please hop on over, so you can visit all the other amazing designers' creations using the new October Kit of the Month. Ohhh, and did you know that their Kit of the Month is the best deal in town????? It's only $24 + $5 shipping!!! And you get a whole 8.5" x 11" rubber images each month and on top of it, there is no commitment! I have been addicted to their stamps now since April....and love every single one!! Have a fabulous day! I will be back with more tomorrow...so please come back. Also, don't forget this Saturday is World Card Making Day! I will be playing along in two places. Splitcoaststampers and also Treasured Scrapbooking is going to have a ton of card challenges....so come visit!